Whether you’re a one-man-show, or a fairly large multinational organization, your basic communication requirements remain the same. We all need email, file storage, calendars, and other tools to help us operate our businesses efficiently. Google Apps offers a highly effective, cost-efficient bouquet of services that businesses of virtually any size can benefit from tremendously. 1. It comes with an email service that you know and love. Gmail is the world’s most widely used email provider with over 425 million users worldwide1. With its intuitive, attractive user interface and a plethora of functionality to help you sort, organize and filter through your never-ending stream of email messages, Gmail is probably the best thing to hit the Internet since Google Search itself. The downfall of using Gmail as a business is that it just isn’t professional. Imagine handing out business cards with BestRealEstate743@gmail.com – it looks a bit dodgy. What if you can enjoy the beauty and simplicity of Gmail, but maintain your more professional Ahmad@BestRealEstate.com email address? Well, with Google Apps you can. In addition, Google Apps gives you tons of additional features that spice up the usual Gmail experience. You can share contacts across the organization, create nicknames for email addresses, and so much more. 2. Google Drive can take you to places your organization has never been. We’ve all experienced at some point in our careers the situation where you need to access a company file on the go, but don’t have your laptop with you. With Google Drive, you can store all the files you need (in their original formats) and access them from any web browser or even your mobile phone (through their mobile site or app). Not only can you access your files from virtually anywhere in the world (actually, literally anywhere in the world!) but you can also create and modify the most needed file types. You can create documents, spreadsheets, presentations, and even diagrams, that can be downloaded in the usually-required Microsoft formats, or even PDF for quick printing. 3. It comes with all the Google goodies you could ever want. Your Google Apps account gives you access to all the usual Google features (well, most of them anyway). Login to YouTube, Picasa, Adwords, Adsense, or whatever your heart desires using nothing more than your company email address. This ability expands your organization’s communication abilities tenfold with so many amazing, free services offered by Google. 4. Staying connected with your colleagues and employees was never this easy. As we mentioned above, Google Apps allows you to utilize practically all of Google’s services for free. Google Talk is no exception. You can chat with colleagues and anybody else with a Gmail or Google Apps account. Voice and video chat are also included. 5. Google keeps you organization safe. When we tell clients about Google Apps, many of them are concerned about having their employees run amuck watching YouTube videos, chatting with each other needlessly throughout the day, and possibly exposing corporate sensitivities to the world. Firstly, that’s where corporate policy comes into play, but more importantly, Google has already taken this into consideration. They give you, as the Administrator, full control over what services are available and accessible by your users. In addition, two-factor authentication can be enabled, ensuring that your users can only login once they’ve provided three things: their username, password, and a time-sensitive code that is sent to them at the time of logging in through SMS or an automated phone call from Google. Every organization we’ve recommended Google Apps to has quickly realized and reaped its benefits. And it doesn’t come at much of a cost. 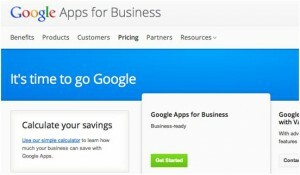 Google Apps starts at $5 per user, per month. That’s $60 per year for a plethora of services, features, and functionalities. Over and above, the service is sure to improve productivity, and take your organization to the next level. If you would like to talk to an expert about how Google Apps for Business can improve your organization’s productivity and efficiency, please contact us and we’ll gladly arrange a time to meet. In addition, our team of trained professionals can help you setup your Google Apps account, and assist in the migration of your data. You’ll be up and running in no time, and it’ll change the way you do business forever. That’s a promise. Which search engine is most popular?